Joseph Déjacque (French: [deʒak]; December 27, 1821, Paris – 1864, Paris) was a French early anarcho-communist poet and writer. Déjacque was the first recorded person to employ the term libertarian (French: libertaire) for himself in a political sense, in a letter written in 1857 criticizing Pierre-Joseph Proudhon for his sexist views on women, his support of individual ownership of the product of labor, and of a market economy, saying: "it is not the product of his or her labor that the worker has a right to, but to the satisfaction of his or her needs, whatever may be their nature." Of unknown origins, Déjacque was first heard of when arrested as part of the revolutionary upheavals in France in 1848. Imprisoned for a time for socialist agitation, he was released but rearrested in 1851, and was sentenced to two years of prison for his collection of poems Les Lazaréennes, Fables et Poésies Sociales, with an additional penalty of 2000 francs. He escaped to London around the time of the December 2, 1851 coup d'état. While in Jersey between 1852 and 1853 he published "La question révolutionnaire", an exposition of anarchism. From there he went to the USA where he spoke to workers associations in New York and was a signatory to the programme of the First International there in 1855. Whilst staying in New Orleans from 1856 to 1858, he wrote his famous anarchist utopia L'Humanisphère, Utopie anarchique, but could not find a publisher. Returning to New York he was able to serialise his book in his periodical Le Libertaire, Journal du Mouvement social. Published in 27 issues from June 9, 1858 to February 4, 1861, Le Libertaire was the first anarcho-communist journal published in America. This was the first anarchist journal to use the term "libertarian" Among many articles on revolution and current political events both in France and the USA he attacked the hanging of John Brown after the raid on Harpers Ferry and propagandised for the abolitionist cause. His stay in New York ended when his work prospects ran out due to the economic slump occasioned by the outbreak of the American Civil War. He returned to London and then to Paris following the amnesty, where he died a few years later in extreme poverty. The writings of Déjacque could be seen as one who "up until the foundation of anarchist communism properly so-called, expressed in a coherent way the radical communism which emerged in France from the 1840s as a critical appropriation of Fourierism, Owenism and neo-Babouvism. Déjacque’s work was an examination of the limits of the 1848 revolution and the reasons for its failure. It was developed around a rejection of two things: the state, even if ‘revolutionary,’ and collectivism of the Proudhonist type. Déjacque reformulated communism in a way that sought to be resolutely free from the dogmatism, sectarianism and statism exhibited by those such as Cabet and La Fraternité de 1845. Déjacque spoke of: “Liberty! Which has been so misused against the community and which it is true to say that certain communist schools have held cheap.”"
Déjacque "rejected Blanquism, which was based on a division between the ‘disciples of the great people’s Architect’ and ‘the people, or vulgar herd,’ and was equally opposed to all the variants of social republicanism, to the dictatorship of one man and to ‘the dictatorship of the little prodigies of the proletariat.’ With regard to the last of these, he wrote that: ‘a dictatorial committee composed of workers is certainly the most conceited and incompetent, and hence the most anti-revolutionary, thing that can be found...(It is better to have doubtful enemies in power than dubious friends)’. He saw ‘anarchic initiative,’ ‘reasoned will’ and ‘the autonomy of each’ as the conditions for the social revolution of the proletariat, the first expression of which had been the barricades of June 1848. In Déjacque’s view, a government resulting from an insurrection remains a reactionary fetter on the free initiative of the proletariat. Or rather, such free initiative can only arise and develop by the masses ridding themselves of the ‘authoritarian prejudices’ by means of which the state reproduces itself in its primary function of representation and delegation. Déjacque wrote that: ‘By government I understand all delegation, all power outside the people,’ for which must be substituted, in a process whereby politics is transcended, the ‘people in direct possession of their sovereignty,’ or the ‘organised commune.’ For Déjacque, the communist anarchist utopia would fulfil the function of inciting each proletarian to explore his or her own human potentialities, in addition to correcting the ignorance of the proletarians concerning ‘social science.’"
Le Libertaire, Journal du mouvement social. 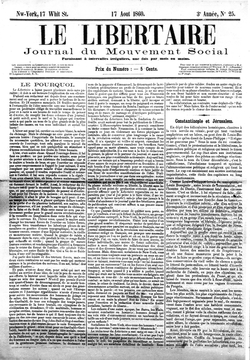 Libertarian Communist publication edited by Joseph Déjacque. This copy is of the August 17, 1860 edition in New York. He also thought that "government, religion, property, family, all are linked, all coincide.’ The content of the social revolution was thus to be the abolition of all governments, of all religions, and of the family based on marriage, the authority of the parents and the husband, and inheritance." Déjacque established his proposed state as follows "“the state of affairs where each would be free to produce and consume at will and according to their fantasy, without having to exercise or submit to any control whatsoever over anything whatever; where the balance between production and consumption would establish itself, no longer by preventive and arbitrary detention at the hands of some group or other, but by the free circulation of the faculties and needs of each." Déjacque criticized French mutualist anarchist Pierre Joseph Proudhon as far as "the Proudhonist version of Ricardian socialism, centred on the reward of labour power and the problem of exchange value. In his polemic with Proudhon on women’s emancipation, Déjacque urged Proudhon to push on ‘as far as the abolition of the contract, the abolition not only of the sword and of capital, but of property and authority in all their forms,’ and refuted the commercial and wages logic of the demand for a ‘fair reward’ for ‘labour’ (labour power). Déjacque asked: ‘Am I thus... right to want, as with the system of contracts, to measure out to each — according to their accidental capacity to produce — what they are entitled to?’ The answer given by Déjacque to this question is unambiguous: ‘it is not the product of his or her labour that the worker has a right to, but to the satisfaction of his or her needs, whatever may be their nature.’ [...] For Déjacque, on the other hand, the communal state of affairs — the phalanstery ‘without any hierarchy, without any authority’ except that of the ‘statistics book’ — corresponded to ‘natural exchange,’ i.e. to the ‘unlimited freedom of all production and consumption; the abolition of any sign of agricultural, individual, artistic or scientific property; the destruction of any individual holding of the products of work; the demonarchisation and the demonetarisation of manual and intellectual capital as well as capital in instruments, commerce and buildings." "Attractive labour" and "The Humanisphere"
Déjacque advocated "the transformation of work into ‘attractive work’...as the condition for the existence of the community: ‘The organisation of attractive work by series would have replaced Malthusian competition and repulsive work.’ This organisation was not to be something exterior to productive activity. Déjacque’s communist anthropology was based on the liberation of needs, including the need to act on the world and nature, and made no distinction between natural-technical necessities and human ends. Although its vocabulary was borrowed from (Charles) Fourier (harmony, passions, series and so on), it aimed at the community of activities more than the organised deployment of labour power: ‘The different series of workers are recruited on a voluntary basis like the men on a barricade, and are completely free to stay there as long as they want or to move on to another series or barricade.’ Déjacque’s ‘Humanisphere’ was to have no hours of work nor obligatory groupings. Work could be done in isolation or otherwise...As to the division of labour, Déjacque proposed its abolition in a very original way. What he advocated was a reciprocal process of the integration of the aristocracy (or rather of the aristocratic intelligentsia) and the proletariat, each going beyond its own unilateral intellectual or manual development. " Déjacque "was perhaps exasperated by the gulf between the results of his utopian research and the content of the class struggle in the 1850s, and tried to bridge this gulf with a theory of transition. This theory aimed to facilitate the achievement of the state of community, while taking into account the existing situation. Its three bases were, first, ‘direct legislation by the people’ (‘the most democratic form of government, while awaiting its complete abolition’); second, a range of economic measures which included ‘direct exchange’ (even though Déjacque admitted that this democratised property without abolishing exploitation), the establishment of Owenite-type ‘labour bazaars,’ ‘circulation vouchers’ (labour vouchers) and a gradual attack on property; and third, a democratisation of administrative functions (revocability of public officials, who would be paid on the basis of the average price of a day’s work) and the abolition of the police and the army." 1 2 The Anarchist FAQ Editorial Collective. "150 years of Libertarian". 1 2 Anarchism: A Documentary History of Libertarian Ideas – Volume One: From Anarchy to Anarchism (300CE to 1939)], ed. Robert Graham; includes English translations from Déjacque's The Revolutionary Question and his 1857 letter to Proudhon. 1 2 3 4 5 6 7 Alain Pengam. "Anarchist-Communism"
An english language translation of Joseph Dejacque's utopian vision "L'Humanisphere" at the Digital Reource Commons of the University of Cincinnati.